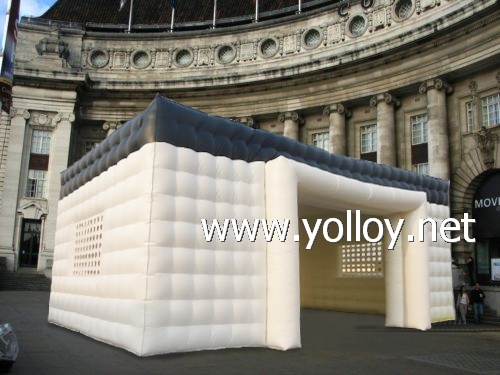 A classic cube tent with classic color white and black. Dots are also classic style for cloth, but when coming into this cube tent, the dot windows make the inflatable cube tent very unique and beautiful. It is produced by double stitching everywhere and four fold stitching at the stress-points. At the bottom of the tent, there are big fasten anchoring to help fix the tent onto ground. The material PVC tarpaulin is UV-resistant, flame-retardant, it is 3 years warranty even for commercial use everyday. To operate the tent event, it is very simple, after put the inflatable tent on to the ground, link the blower, It just take about 5 minutes to inflate it up. It is very efficient building. For more information, you are welcome to contact.